Dan Dimovski, the president of the Pharmacy Franchisee Association of Canada, said Target has given its pharmacists until Feb. 26 to shut down their franchises inside the stores. But he said that's impossible because they have to follow provincial regulations to close. The closure of Target stores across the country has pharmacists scrambling. Both the Sudbury and North Bay stores have pharmacies. Dan Dimovski, the president of the Pharmacy Franchisee Association of Canada, said Target has given its pharmacists until Feb. 26 to shut down their franchises inside the stores. But he said that's impossible because they have to follow provincial regulations to close. “We're talking about medications, processes to protect the patient and our position in our association is the actions of Target are undermining the Canadian processes that protect the patients on a provincial level,” he said. Dimovski noted pharmacists must apply for accreditation 30 days before moving to a new location. If they are closing, they need to ensure their stock of medications is transferred to another pharmacy or returned to the supplier. “We're in a catch-22 situation,” Dimovski continued. PFAD represents more than 80 independent pharmacies operating in Targets across the country. The association has taken legal action to be recognized in Target's bankruptcy case and is drafting letters to premiers and MPs highlighting the concerns of independent pharmacists over the imminent store closures. Dimovski said the association wants to be recognized in Target's bankruptcy process, and is asking for their moving expenses to be covered and to be able to operate until the store closes. 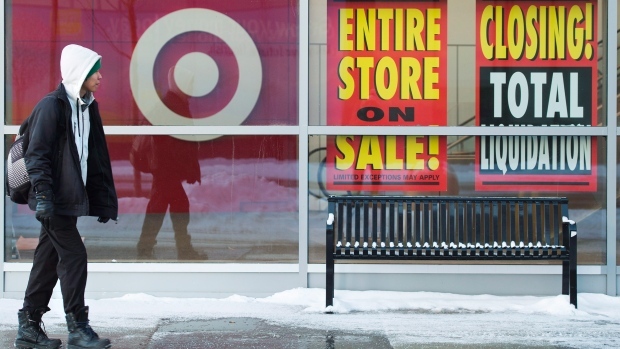 The U.S. retail chain announced in January it will close all its locations in Canada. There are 133 stores across the country with about 17,600 employees. Target Canada did not respond to a request for comment. Tim Hortons's franchisor got the job done by defeating the modernization of this 1960s-era law. These prospectus-like documents form the basis of any rational business due diligence. Since 1970 the US FTC has ensured that US small business families can access these documents publicly. • To meeting this commitment, the ministry is reviewing 19 corporate and commercial statutes, including the AWA"
I replied to the Ministry that I had asked 3G Capital for a copy of their CDN disclosure documents and would keep them informed of 3Gs response. I have the USA Hortons documents because they are free to download (without a salesman breathing down your neck) in 4, soon to be 5 (New York) states. None of the 5 (soon to be 6) of the CDN franchise provincial laws require an online repository of these crucial due diligence documents. "Efficient market and prosperous business climate" for mom-and-pop CDN franchisees? The current leadership of Target Corp has the Dayton forefathers spinning in their graves. The secret to the Dayton family success was impeccable preparation in everything they did. (For those who don't know, the Dayton family started a department store in Minneapolis, MN in 1902, sixty years later they opened the first Target store.) The Dayton who set up the first Target store monitored it closely and tweaked the merchandise on a continuous basis finding what did and didn't work. That manner of doing business was maintained as the chain expended. Back in my youth, that attention to detail was so strong that what was available on in a Target in St. Louis Park might not be stocked in Roseville (site of the first store). Obviously, this attention to detail is no longer part of the corporate culture, pity - and sorry a MN company has let you down.